Free Tank Carter: Wow. So, that happened. One of the things I mentioned during my talk with WESA's Larkin Page-Jacobs in the segment which aired on Wednesday (give it a listen!) was that for the last 20 years, Pirates fans have lived for a series of fleeting moments. They're not about hope. They're not about next year being our year. They're just quick moments over the course of lost, abysmal seasons that make you glad you went out to the ballpark that night, or that you were paying attention to the game on TV or listening on the radio. Rob Mackowiak's walk-off grand slam in game one of a twi-night doubleheader against the Cubs, just hours after the birth of his first child, is always one of the first to come to mind. In the second game, Mack hit the game-tying home run and Brian Giles came up with the winner. This is one of those moments. Jason Michaels's home run capped an unbelievable comeback against the Cardinals in July of 2008. The Pirates were down 9-3 in the 7th and 10-4 in the 8th. The Bucs went on to win the game 12-11. Lloyd got his money's worth, then just pulled the base out of the ground and walked stoically off the field with it. 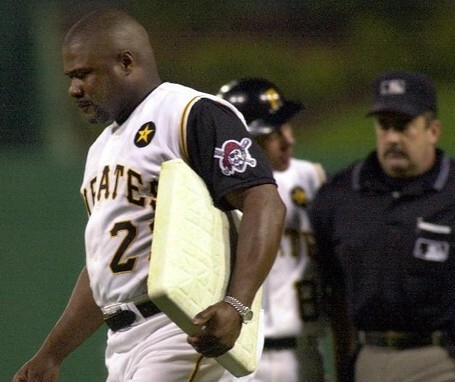 That's one of the all-time great managerial tantrums, and it was incredible to watch. This one stands out, too. Man, that guy was a dickhead. Wonderful ballplayer. All-time dickhead. On April 25th, 2003, Kip Wells hit an Odalis Perez offering off of the batter's eye and into the shrubbery in dead-center field. It was the least kipwellian moment of his career, but man. On the last day of the waiver trade deadline in 1997, the "Freak Show" Pirates acquired Shawon Dunston from the Cubs. In hist first game with the team, Dunston hit two home runs. That was the last time the Pirates were in a tight divisional race so late in the season. So of course, when this happened on Wednesday, there wasn't a die-hard Pirates fan alive who didn't instantly think of Shawon Dunston. It's fitting that the segment aired on Wednesday, and that of the hour I spent talking to Jacobs, she chose to use that clip about the essence of being a Pirates fan existing in those moments. I really like the trade. Marlon Byrd is at least twice as good as anyone the Pirates have played in right field this year, and the depth he and John Buck add to the roster was exactly what the team needed -- added offensive stability. The home run was great. It was one of those moments. Refreshingly, this is the first time in a while in which the context outweighs the moment. Here's to more of those.